As part of my parliamentary duties on the European Parliament's "environment" committee (environment, public health and food safety) , I am following a proposal on the European Union's "civil protection mechanism". 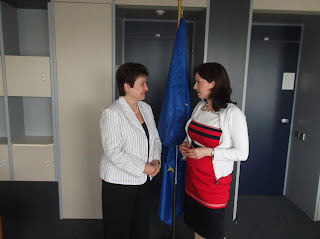 Yesterday I met the European Commissioner for Humanitarian Aid and Crisis Response, Kristalina Georgieva to discuss the proposal. "Civil protection" is the term used to describe what countries do to protect citizens and infrastructure against man-made and natural disasters such as floods, forest fires, earthquakes, oil spills and bioterrorist attacks. In recent years, the number of disasters being experienced by EU countries, particularly those related to climate change such as floods and forest fires, have increased in number and severity. The Intergovernmental Panel on Climate Change (IPCC) report on extreme weather unfortunately concludes that climate change related disasters are likely to increase everywhere. When a natural or man-made disaster occurs, many EU countries can manage the disaster, but increasingly as disasters become more severe and more frequent, countries are calling on each other for assistance. Up until now, any European cooperation has been ad-hoc and hastily agreed once the disaster has occurred. The proposal now going before the environment committee seeks to improve this cooperation by creating a framework (called the "civil protection mechanism") within which it will take place. The mechanism will enable countries to agree in advance what assistance and resources they can make available to each other (and third countries when necessary) in the event of a disaster. In addition, it will require countries to produce and share disaster risk management plans to allow gaps in capacity to be identified, which can help countries improve their civil protection capabilities, as well as guiding other countries as to the kind of assistance that country might need should a disaster occur. This may sound a little dry and technical and you may wonder how that could be relevant to Yorkshire and the Humber. It may be indeed very relevant when it comes to floods, which sadly our region has suffered from in recent years. The UK authorities are generally (and certainly compared to some other EU countries) well prepared and able to act in the event of floods. 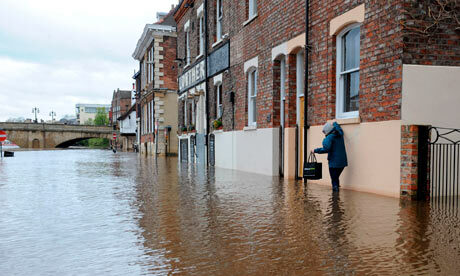 However, as residents of places like Hull and York can confirm, there is still room for improvement in flood response. One aspect which I am particularly keen to see in the Report, is an increased responsibility for the UK to assess their own risk management plans. One of the key problems of the 2007 Hull floods was that the drains designed to carry off flood water were badly blocked. This even led to the loss of a life when a local man attempted to clear drains himself during the worst of the flood. Hopefully the damage Hull experienced in 2007 will not be repeated if the UK and other countries are brought up to a common standard and sufficiently assess any gaps in their civil protection capabilities . The creation of this mechanism will allow the UK authorities to call for assistance from other EU countries with experience of dealing with disasters such as floods. In doing so, the UK authorities would know in advance what kind of assistance different countries could provide. Anyone who has experienced a flood knows that time is of the essence and a commonly made complaint is the delay in help reaching those who need it, rather than the assistance eventually received. The civil protection mechanism could prove extremely useful in this respect. If anyone has any questions or would like further information on the civil protection mechanism, please contact me.